Senior representatives from Carnival Corporation, Tirrenia, P&O Cruises and Mediterranean Shipping Cruises will join in Genoa a panel of experts for the first Seatrade Mediterranean Cruise and Ferry Convention, 17-20 September 1996. Other distinguished speakers include Aldo Grimaldi of Grimaldi Group (Ausonia cruise ship and Grandi Navi Veloci cruise ferries) Costa Crociere president Nicola Costa, Corrado Antonini of Fincantieri and Pericles S. Panagopulos, president of Attica Enterprises (Superfast Ferries). The conference focuses exclusively on the Mediterranean, its cruise and ferry industries, and the prospects for growth in both sectors. General sessions, involving all delegates, are balanced with specific industry topics. Among the topics to be discussed are cruise ship design, passenger ship technology, port facilities and ship safety. Highlights for ferry delegates include sessions on fast ferries, and an analysis of the Mediterranean ferry market and its prospects. Interest in the Mediterranean is international, as reflected in the geographical spread of conference delegates. Partecipants from the USA, the Caribbean and Asia will join an array of European delegates for the four-day programme. Partecipants involved in both the conference and the exhibition (see the picture of the Genoa fairgroung) currently represent 23 countries worlwide. An exhibition of over 3,500 square metres with the latest products, services and technology runs alongside the conference. Cruise lines, classification societies, shipbuilders, ship agents, ferry operators, outfitters, marine equipment, pollution control systems, deck equipment, port authorities, consumer retail, entertainment, trade associations, telecomunications, chandlers and tour operators will all be represented, along with national pavilions from Austria, Denmark, Finland, France and U.K. 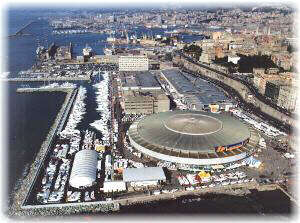 The port of Genoa (see the picture of the cruise terminal) is a fitting location for this major gathering of cruise and ferry representatives. Some 2,200 passenger vessel and 2.5 milion passengers visited the port last year - a record. 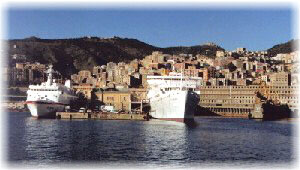 With its strategic location Genoa has invested heavily in terminal ficilities for cruise and ferry passengers. With its new conception the port, the most important industry of Genoa, becomes the city heart merging to form part of the urban panorama in a harmonious and prestigious recomposition of its waterfront.